If you just think of beaches when you think of the Dominican Republic, you are missing out on a great city and its heritage. My trip to the island was highlighted by both an amazing history of the up and coming Caribbean city of Santo Domingo, and the beautiful white sandy beaches of Punta Cana. My stay started at the JW Marriott, Trip Advisors 2017 Travelers’ Choice Awards as the Best Luxury City Hotel in the Americas, in the center of the business district of Santo Domingo. The upscale brand is exactly as you would expect. 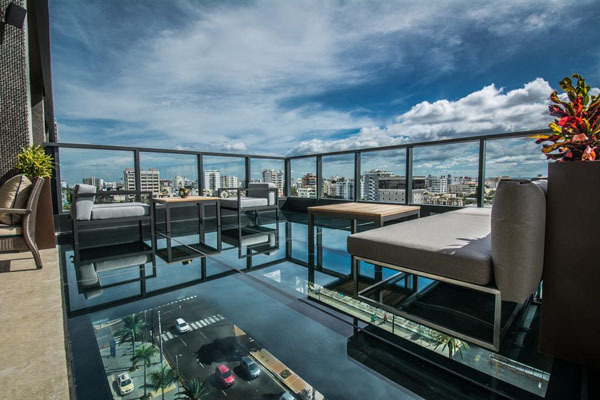 A beautiful lobby with chic bar area which leads to the unforgettable glass floor balcony of the Vertygo 101 Lounge which is set 101 feet above Winston Churchill Avenue, which is quite the experience. There is a rooftop infinity pool, and full gym overlooking the skyline. There are fully equipped meeting facilities and grocery shopping services. Attentive associates eager to help wherever I turned. The rooms are luxuriously appointed. The marble bathrooms have a walk through shower to a soaker bathtub and a double vanity with a TV in the mirror. A highlight of this hotel is The Winston Grill & Patio that serves international cuisine. Chef Alberto Martin was more than accommodating, serving a tasting menu that was absolutely delicious. So much so, that I had to go back for 2 more breakfasts and another dinner. When talking about the JW Marriott in Santo Domingo one must include the Blue Mall located directly below the hotel. The mall offers luxury shopping for the affluent traveler. If staying in the heart of the business district is not what quite what you are looking for, then a stay at the Renaissance may be more to your liking. A bit more traditional in the sense of a Carribean resort, view of the ocean and a large pool with lots of lounging options along with pool side dining. The Renaissance also has a casino for those looking for the excitement of some gambling action. 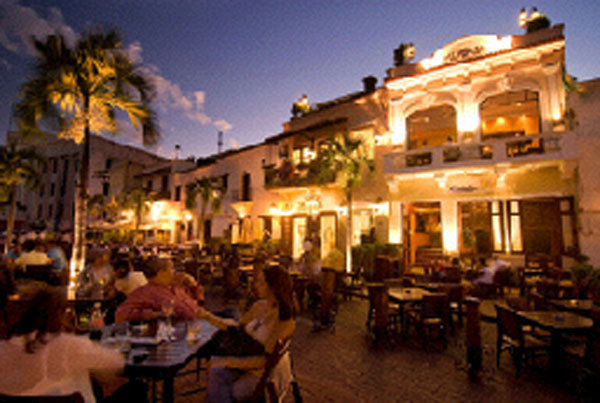 A must when visiting Santo Domingo is the Colonial Zone. It is where Columbus had decided to establish the first settlement in the New World for Spain. Most of the buildings date back to the early 16th century, the earliest from 1502. “The First Tavern of the America’s”, Pat’e Palo, was established in 1505. This was a hangout for the pirates of the time, now a must go-to for a refreshing El Presidente. There is the first palace of the governor of the New World, which still stands although it was burned out by warring countries long ago. Now mostly furnished with reproductions, it gives great insight to what life was like in the New World during the 16th Century. The Colonial Zone is also known for its nightlife and restaurants. I had a traditional Dominican lunch at Jalao, which included mofongo, a very tasty dish with a special place in the hearts and stomachs of the Dominicans made of flavored mashed plantains, garlic, oil and pork rind. A must when there is to have dinner at Buche’Perico, which is situated in one of the older remaining residences. The dining area is in the actual backyard also dating back to the 1500’s which is absolutely magical….. Whether you are a history buff, or not, this is an amazing place. For the nature lovers there is Tres Ojos National Park. It is almost as if you are stepping into a lost world located in the center of a large city. 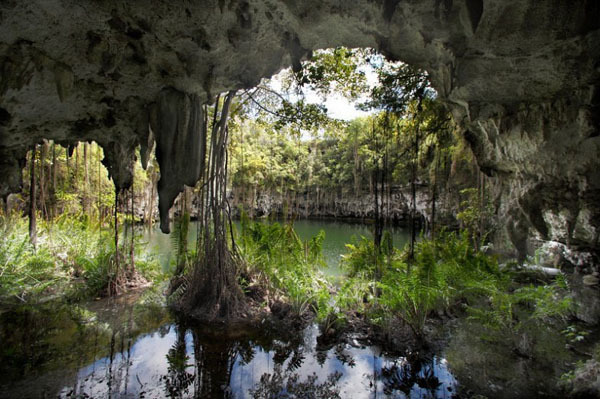 A group of interconnected limestone caves with crystal clear blue water lagoons is only a short car ride from the Colonial Zone. The second half of my trip was spent in beautiful Punta Cana, a place of baby powder beaches and light aqua waters. Just minutes from the airport, my home while there was the Westin Resort. Everything one would expect from a 5-star beachfront resort. The hotel’s wellness programs are based on what the brand calls its “six pillars.” Rest Well, Eat Well, Move Well, Feel Good, Work Well, and Play Well. The hotel provides dishes with SuperFoodsRX . Guests also have access to a full gym. For the running enthusiast, a running tour is provided with routes of up to 3.66 miles long situated within the Punta Cana Resort and Club. Multiple pools with cabanas, a beach front restaurant with breathtaking views, beach lounges with friendly food and beverage service. 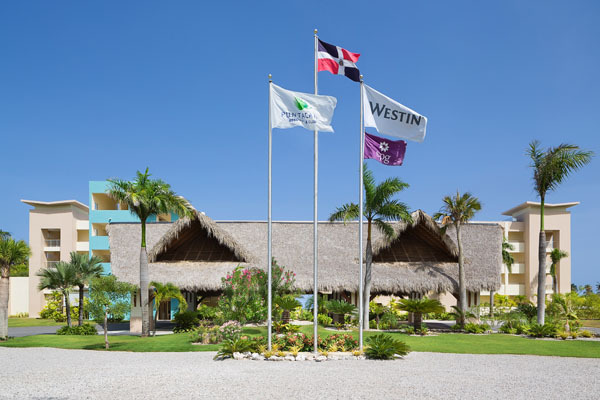 The Westin Resort is part of the Punta Cana Resort and Club. 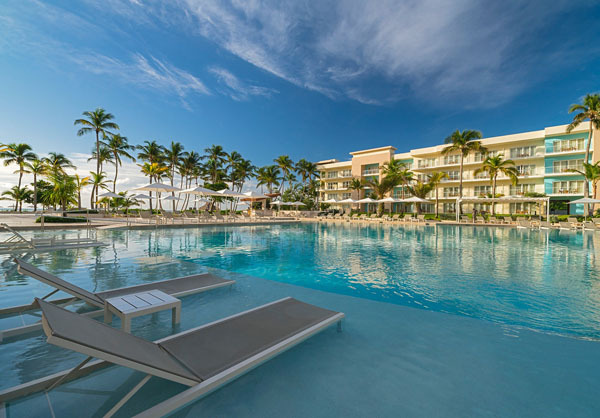 This is home to two golf courses, 45-hole “Los Corales” and “La Cana”, the La Cana Beach Club and Six Senses Spa, all of which are at your disposal while staying at the Westin. The “Los Corales” golf course will be hosting its first PGA tour in March of 2018. This is the first PGA event in the Dominican Republic. Other accommodations at Punta Cana are the Tortuga Bay Resort, which is under renovations and the Four Points, by Punta Cana Village. For the ultimate in privacy and luxury, there are private residences, complete with staff and service which are available for rent. Besides relaxing by the ocean, there were a few highlights to be noted. The “Los Corales” Golf course is a must if you play the game. Overlooking the Caribbean Sea, the course is both challenging and breathtaking. The Six Senses Spa has everything needed to help you relax and reset. This upscale spa offers an array of treatment rooms, including one directly on the beach, and peaceful settings in which you can enjoy the rejuvenating therapies of their international team. The spa also offers in room treatments for the ultimate in relaxation and convenience. For the tennis enthusiast, the Oscar de la Renta Tennis Center has 13 tennis courts, a pro shop, a full gym and a patio with snacks and drinks which is available to all hotel guests. For the nature lover there is The “Ojos Indígenas” Ecological Park and Reserve, a 1,500-acre private reserve owned and maintained by the Grupo Punta Cana Foundation. The Ecological Reserve is comprised of a network of trails that lead to 12 freshwater lagoons and provides habitat for an abundance of birds, reptiles, insects, and other local flora and fauna. Walking the trails and swimming in the lagoons is a fun way to spend time with or without the family. The dining experiences while in Punta Cana are also top notch. For beachside dining, Playa Blanca offers a romantic setting with ocean views while La Yolo is a AAA three diamond restaurant that perches on the sea at the Punta Cana Resort & Club Marina, with magnificent views of the sparkling turquoise waters. The Grill Restaurant at the La Cana Golf and Beach Club is the perfect setting for a relaxing meal on the beach. Chef Santiago Salamanca served us a tasting menu that was delicious and never ending. Every dish he served was mouth watertingly delicious. Both Punta Cana and Santo Domingo have so much to offer for visitors to the Dominican Republic. And although Punta Cana is more of a traditional Caribbean vacation, there is so much more to be seen in the rich history of this island, that one would be amiss to pass it by.